The Television Crossover Universe: R.U.R. 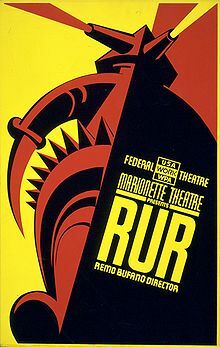 This blog post will be on R.U.R., a 1921 play that introduced us to the word "robot", although technically, the robots of the play are really what we would today call clones, since they are artificially created humans of flesh and blood, not mechanical beings. 1928--Eric, a robot constructed in Britain in 1928 for public appearances, bore the letters "R.U.R." across its chest. Read more here. Non-Horror Crosses: All-Star Squadron; TNT and Dan the Dyna-Mite; Aarn Munro; Hawkman (Golden Age); Robotman (Golden Age); Miss America; Justice Society of America; Superman (Golden Age); The War that Time Forgot; Wildcat; Metropolis; G.I. 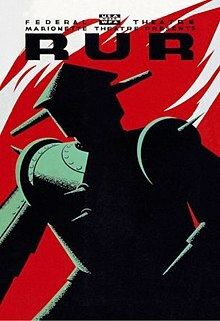 Robot; R.U.R. The Story: Deathbolt attacks Project M to steal a T-Rex and place the Ultra-Humanite’s brain in it. Notes: King Kong’s remains are seen at Project M. Project M is from the Creature Commandos series, which has been brought in via a New Adventures of Frankenstein tale by Donald F. Glut. This story does not bring in the entire Young All-Stars series or DC Comics line. The Utlra-Humanite was introduced in the golden age Superman series. Most people only know Luthor and Zod as Superman's foes. Professor Rossum is referenced. The story was written by Roy and Dann Thomas based on the concept by Jean-Marc Lofficier, who provided information on his crossovers to Win Scott Eckert, which he listed in Crossovers: A Secret Chronology of the World. 1940s--BATMAN: THE ANIMATED SERIES--The scientist that created the HARDAC machine is named Karl Rossum. HARDAC created mechanical replicants to replace existing humans, with the ultimate goal of replacing all humans. One of the robots is seen driving a car with "RUR" as the license plate number. 1980s--TIME SQUARED--In Howard Chaykin's Time² graphic novels, Rossum's Universal Robots is a powerful corporation and maker of robots. 2009 to 2010--DOLLHOUSE--The antagonist corporation, Rossum Corp., is named after the play. 2035 A.D.--OUTER LIMITS--"I, Robot"--In the 1995 science fiction series The Outer Limits, in the remake of the "I, Robot" episode from the original 1964 series, the business where the robot Adam Link is built is named "Rossum Hall Robotics". 23rd Century--BLAKE'S 7--"The Syndeton Experiment"--The 1999 Blake's 7 radio play The Syndeton Experiment included a character named Dr. Rossum who turned humans into robots.